Family Friendly Gaming never sounded off on Shadow of the Colossus when it was on the Playstation 2. It was decided to check this game out on the PS4. 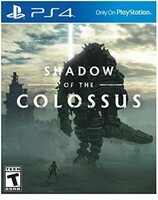 FFG could have saved some money by buying Shadow of the Colossus on the PS2. This game is messed up big time. Shadow of the Colossus fits the rebellion against God image Sony has earned. There are plenty of evil, and demonic characters in Shadow of the Colossus. Players assist evil in Shadow of the Colossus. Which is shocking on so many levels to us here at Family Friendly Gaming. Again very typical of Sony. Shadow of the Colossus is dark in other ways as well. We have to go hunt down these giants and kill all of them. In the process we are freeing parts of an evil demonic Satan like characters soul. In essence Shadow of the Colossus has us play a servant of Satan. Isn’t that special? Shadow of the Colossus also teaches us to pray to false idols to get our health back. Maybe there should be an easier way out of that temple? Expect a full review of Shadow of the Colossus on the Playstation 4 (PS4) in an upcoming issue of the stunning, stellar, and super Family Friendly Gaming e-magazine. You can print copies of it too.